Tuukka Rask returned to Boston Bruins practice on Tuesday morning following his leave of absence. The Bruins veteran goalie wasn’t at practice on Friday following the Bruins 8-5 loss to the Vancouver Canucks at home the previous night. The team had then announced he would take a leave of absence. 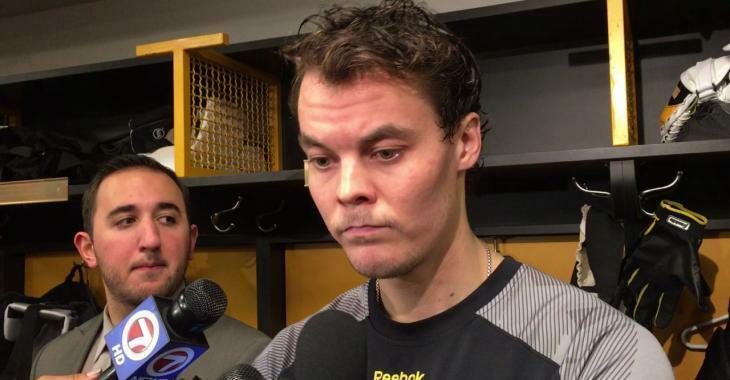 The personal issue Tuukka Rask was dealing with apparently only took three days to resolve as he was back with his teammates this morning and addressed the media about his need to step away from the team. The 31-year-old netminder would not go into specifics as to why he required the leave of absence, but was clearly related to his role amongst his family unit. It seems that it was resolved... for the time being. Rask added a quick "yes" when asked if everything is OK with his family and also admitted he took the time for some soul-searching during his absence. "Things happen in people's lives, and you kind of do some soul-searching and try to seek the best answers," said Rask. "Like I said, there was a time that, deep inside, this was my decision and my time to step to my family and make that call. I couldn't be happier that I did it." A reporter dared to ask if Rask was already pondering retirement, and the star goalie gave a surprising answer to the media members present. He said that idea was "not that far off" but didn't exactly sound like he was ready to hang up the skates just yet. Rask is 4-4-0 with a .901 save percentage and 3.05 goals-against-average in eight appearances this season. Maybe the time away with his family will help him get better in between the pipes.